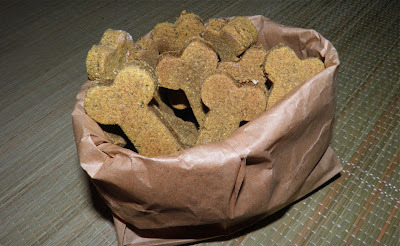 Someone got homemade treats for a present. Today's a very special day in our household. Today our Bouvier – and best pal – Henry, turns 8 years old. How has that happened? It's difficult to believe that it's been 8 years since he came into our lives. Time passes so quickly. Life will pass you by if you don't watch out. 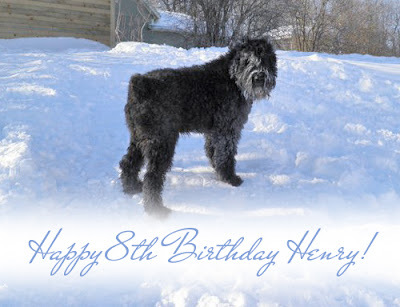 We actually have only lived with Henry for 7-1/2 years. He was one of two "leftovers" from a litter of 8. They were crated at the breeder's during the day so weren't taught a great deal. When we went to look the breeder said that the other puppy was probably the one we would want because he was more outgoing. That puppy paid no attention to us at all. Henry, on the other hand, was supposed to be a very reserved one. Funnily, he wouldn't leave us alone. I believe he chose us, as opposed to the other way around. We love Henry with all our hearts, but I do have to admit that when he first came to our home – at 6 months old – it was a trial. His other father wanted to send him back. He was working nights, and since Henry had been crated at the breeder's we thought we could do the same here at first. Simon (our older Bouvier) was loose in the house to keep him company. Were we wrong. Apparently being crated with his brother and being crated at our house were two completely different experiences. He howled all day. Have you ever heard a Bouvier howl? It's not a soft, quiet whimper. That almost ended it. My spouse was getting no sleep, and I was hearing all about it every day when I got home. It went on for maybe a week. I believe we finally solved it in an obviously simple way. We let him roam the house free with Simon. And he's still roaming. Over the years he's learned to work the two of us really well to get what he wants. He knows who's the "soft touch" at the table (not me), and who's best to come to for lovings (that's me). 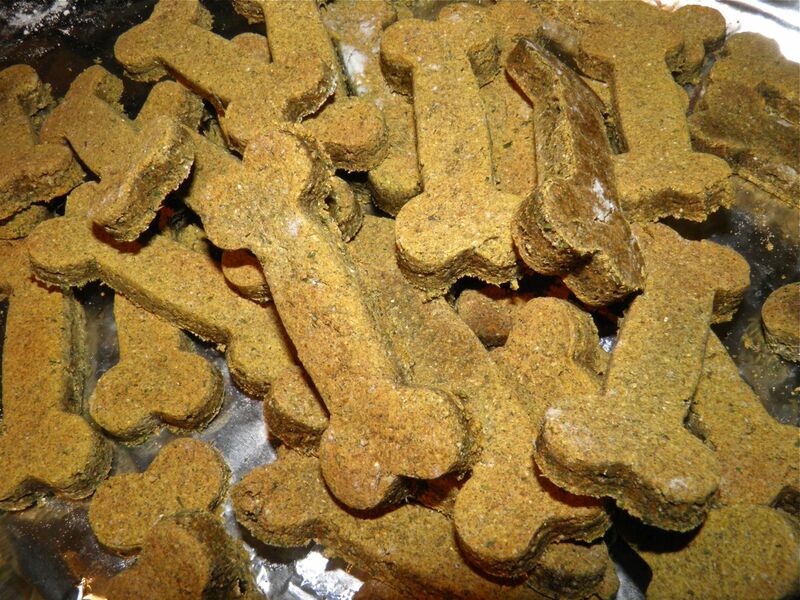 The least we could do was make him some biscuits for his birthday. Henry was certainly interested in the whole process, and even more so as the biscuits baked and their smell filled the kitchen. I even thought they smelled good. There's only good things in these biscuits and they take no time at all to make. The parsley acts as breath "moderator" which is also a bonus. Henry had one that I took out early because it was thinner than the rest. I think he won't mind eating them. In fact, he actually did what looked like a little dance in front of the oven. Mmmm. Good, Dad! 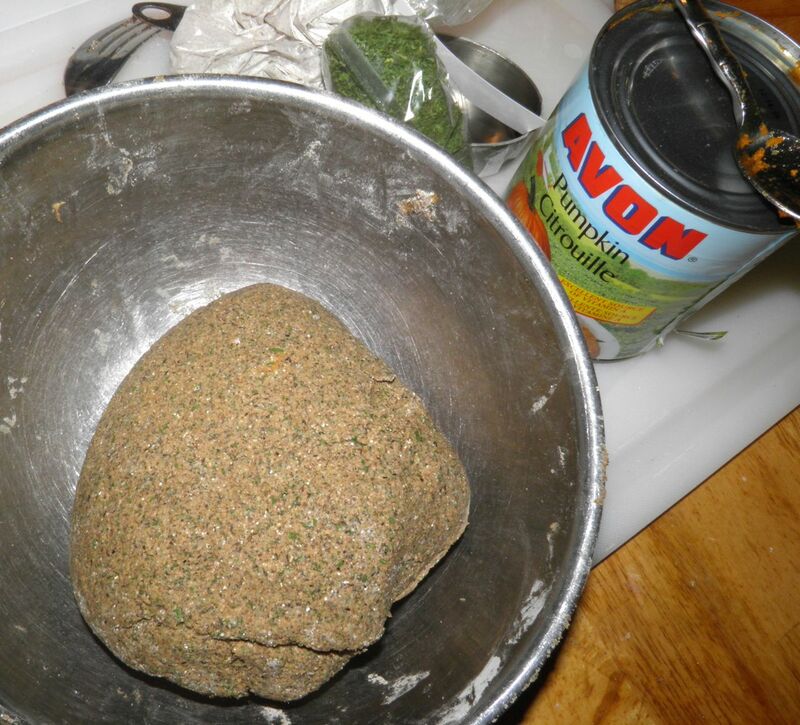 Blend the buckwheat, parsley and salt in a bowl. Add the pumpkin and eggs and knead with your hand. The dough should almost come together and will be very stiff. Add just enough water to bring the last of the buckwheat into the dough. I used 1/4 cup. Flour (a little white flour) a flat surface. Roll the dough out to about 1/4" thick. 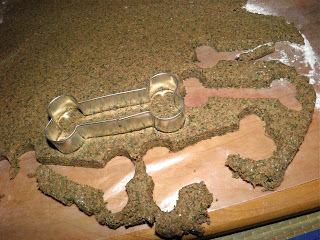 Cut out cookies and place on foil-lined baking sheets. Continue to bring the dough scraps together until all the dough is used. I used a 3" long bone-shaped cookie cutter and the yield was 36. Bake for 20 minutes on the first side. Turn and bake for 20 or 30 minutes more, or until nearly dry. They will continue to dry out a little more as they cool.